I started gardening a couple of years ago. Funny thing I used to live in Seattle, Washington which has a great climate and soil for gardening (you could practically throw something towards the ground and it would grow), and I was not into gardening. Then I moved to Central Oregon where the soil is volcanic pumice lava rock of death or something like that, the growing season is short, and we have little rainfall (as a gardening bonus, ha!). Suddenly, now living in a challenging climate, I decided to start growing a vegetable garden. HOWEVER, today I went over a friend’s house and saw her garden (she is a magical gardener) and left her house with large shared bounty from her harvest: giant squash, celery (I never knew someone who grew celery! 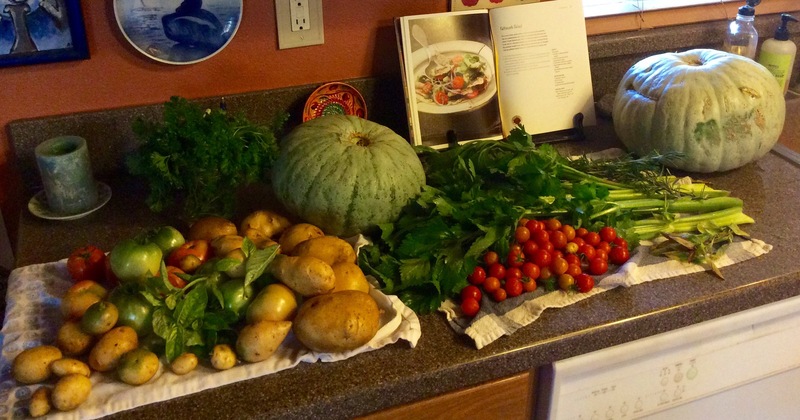 ), Yukon gold potatoes, tomatoes (heirloom and cherry), basil, Thai basil, rosemary, and lots of parsley. It helps to have a friend who is an excellent gardener and generous! My friend has really inspired me to keep on gardening, to learn more about gardening, and to try to expand the areas of my yard that I dedicate to my vegetable garden each year. I hope to be able to share this kind of bounty someday!